If you are from Dział, or have ancestors from this village, please leave a comment or begin a discussion here. Dział is a lovely village in south Poland, in the administrative district of Gmina Czarny Dunajec, in the county of Nowy Targ County, Lesser Poland Voivodeship. These are just some of the surname associated with Dzial. Most are from Ellis Island records and may not be spelled properly, but I have included them in case your ancestor adopted an alternative spelling of their surname. Zapomniane Podhale : czterysta lat wsi - Dział, Odrowąż, Pieniążkowice, Załuczne (Forgotten Podhale: four hundred years of Dział, Odrowąż, Pieniążkowice, Załuczne villages) by Krzysztof Szymusiak-Nowakowski. In the book Zapomniane Podhale : czterysta lat wsi - Dział, Odrowąż, Pieniążkowice, Załuczne (Forgotten Podhale: four hundred years of the villages Dział, Odrowąż, Pieniążkowice, Załuczne), author Krzysztof Szymusiak-Nowakowski listed the names of the families living in Dzial in the 1600's [page 28]. Although John Dzielski, who is a member here as well as I, we can't seem locate our living Dzielski's in Dzial. My maternal grandmother Anna Bienias was from Krauszow, which is very close to Dzial. She married Antony Truchon, I believe in Krauszow where they met and lived before coming to America in the very early 1900's. I would like to know, if there might be a corresponding contact, whether by email or Postal mail, that I can find in the areas of Dzial or Krauszow? Thank you very much, if you can help us on our journey. Enjoy researching family history in Poland. I found in our databases 16 Dzielskis living currently in Dział and 3 Bienias living in Krauszów If you want I will send you phone numbers to these people. I wish to thank you very much as my Dzielski's were very hard to find. I have found one young Dzielski online thru MySpace.com, but unable to contact him because MySpace says he has to contact me. I am thinking that he may have a computer for his MySpace, so this is a great way of communicating with family. Please send the phone numbers as this will help me in getting information on my Paternal and Maternal grandparents and maybe further back. I did send a letter of request to the churches several years ago, but never recieved any information. Is there a Church name address for both that I may Postal mail my questions for birth, marriage and death certificates? You should find the phone numbers in your private messages inbox. Is there a Church name address for both that I may Postal mail my questions for birth, marriage and death certificates? Thank you very much for this information. My Polish language writing is weak but my Heart is with Poland. I use Google translator for any correspondence with emails from Poland. I am not telling about language barrier in correspondence but rather about willingness to reply to such requests, not only in Odrowąż parish. When we looked at the church books at Odrowąż the record books that we accessed were limited to Odrowąż only. So it seems that separate books were kept for each village within the Odrowąż parish. Zenon, you stepped into the office where the books were kept. Did you notice if other village books were on the shelves? Perhaps the Odrowąż parish handed over the records to the Dział church.............. We can only hope so! Are there any members here that have gone to Dzial, or have family there now? Perhaps they can give us some info about the priest at Dzial. When we looked at the church books at Odrowąż the record books that we accessed were limited to Odrowąż only. So it seems that separate books were kept for each village within the Odrowąż parish. That's right Shellie, often there were separate books for each or for a view neighboring villages in the same parish. Zenon, you stepped into the office where the books were kept. Did you notice if other village books were on the shelves? Perhaps the Odrowąż parish handed over the records to the Dział church.............. We can only hope so! It is possible. Often books from the old parishes which used to included the new parish villages are transferred to the new parish. 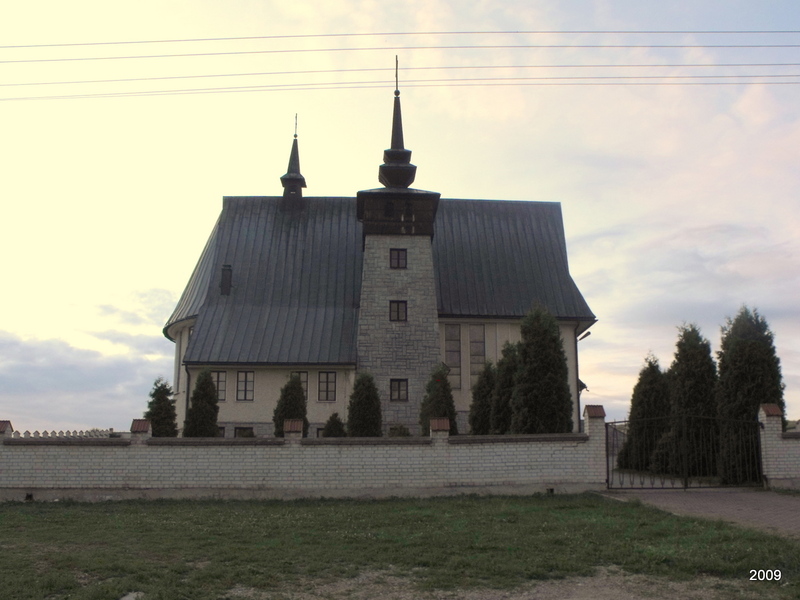 Here is the link to established in 1994 Pieniążkowice-Dział parish : http://www.diecezja.pl/pl/parafie/600-pienikowice-dzia-parafia-mb-bolesnej . I just wanted to drop a note to thank you for sharing this bit of information about Dzial. I believe my great grandfather is from this town from his Ellis Island records, so it was quite nice to see a photo and a little bit of information about the town. I've looked through the book you found a little bit as well, and it's very intriguing as well. Thanks again for sharing all this great information. Thanks Zenon. It's certainly on the "bucket" list. My grandmother is from Dzial - Maria Sikora. She married Bienas from Drugopole and they had my father Ludwik Bienas. In order for him to come to the Utnited States , his aunt adopted him (from Indiana - her name was Anna Konat). Does anyone have information about the Bienas family?? I don't have any info about Bienas from Dzial or Dlugopole, but I do have 3 Bienas' from Odrowaz, a village very close by. I've attached an image. What happened to Ludwik's parents? Did they stay in Poland? Have you connected with the other members here with Bienas ancestors?